Learn more about our Artsy April series. You might be familiar with the annual Dadaocheng Fireworks Festival and Dihua Street Chinese New Year Market, when hordes of people flock into Dadaocheng Wharf and Dihua Street. During those events, Dadaocheng is not ‘slow’ at all; it dolls up, welcoming everyone to experience the festivity of Chinese New Year. When it’s over, Dadaocheng goes back to its original quiet, peaceful alleys. Have you seen it that way? Dadaocheng literally means ‘big rice-drying field’, and once served as an important port of Taiwan, famous for textile and tea trading in the early 1900. In fact, Yongle Market (永樂市場) is still popular for fabric shopping today. Dadaocheng was also the center of the infamous 228 incident. Nowadays, the narrow alleys with century-old buildings, once forgotten, have been remodeled and refunctioned to be a center of culture and creativity. Located across Yongle Market, there is one stand-out building with “A.S. 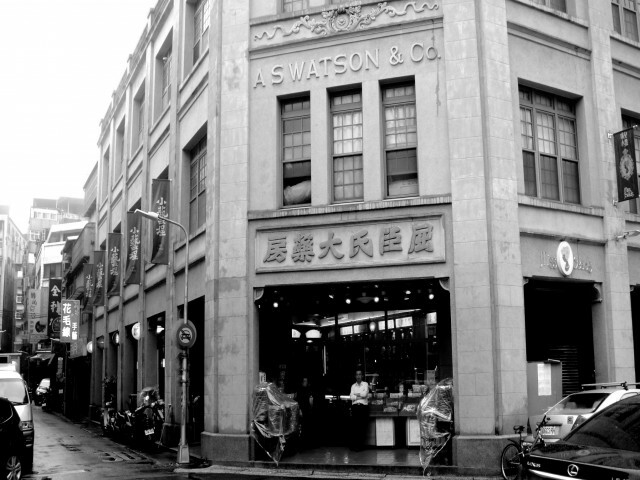 Watson & Co.” written on the outer wall. This building was once a pharmacy and abandoned for more than a decade when a fire destroyed a part of the building. Now A.S. Watson & Co. has been given a new life as Art Yard, and houses different artsy businesses worth checking out. On the first floor, there are Bookstore 1920s and independent textile brand InBloom. The bookstore features an extensive vintage collection of books, particularly art and history. InBloom is a fabric maker, specializing in channeling the Taiwanese spirit into beautiful prints. They also make bags and other cute goods, like chopstick coverings. Onto the second floor, to sip some coffee from Luguo Café, a vintage-themed café serving various selected coffees from all around the world. The café decor certainly captivates us, it is not “cute” like typical café Taiwanese girls love to visit, but has more of an old-fashioned, classy feel. There is petite desk lamp on each table, rattan chairs, an old typewriter, and a collection of vinyl records neatly stacked. And the coffee is great, as well. The third floor is a house for Thinkers Theater, with scheduled hosted music performances, plays, talks and readings. A few meters away from the building, Art Yard has a separate little store called Hakka Blue, a ceramic studio offering unique ceramic collections bound to make your living room more beautiful. We certainly love these dumpling-shaped cups. To rejuvenate some old parts of the city, the Taipei City government introduced a special program called Urban Regenerations Station (URS). It is a platform with an objective to transform historic sites into citizen’s new versions. Each station is independently managed by different institutions, both public and private. URS127 in Dihua Street is currently being operated by the Department of Architecture at Tamkang University, as a think-tank to stimulate a culture-creative atmosphere in Dadaocheng area. The small, seemingly narrow building has a space for art exhibitions, like these colorful fabrics hanging above, seemingly greeting people. Currently there is a toothbrush-themed art panel installed in the main room. A bunch of toothbrushes, to be exact, from plain white to colorful to cartoon-shaped. Who would have thought daily objects could make beautiful art? URS127 also has an open space behind, and there are more to see. This URS is dedicated to the conservation and management of historical resources, as well as urban conservation. The community space is often used for art performance, talks and discussion. When it is vacant, the space is open for public use, for those who want to know the extended history of Dadaocheng, as it is on display on the whole wall of the room. Tucked literally behind URS127, there is a small coffee shop filled with people. The name says Millagarden, which is actually taken from a beautiful legendary garden in Austria, Mirabell Garden. This coffee shop chain aims to provide its customers the joy of sipping high quality coffee with a romantic leisurely atmosphere. The interior of the store is efficient, with some paintings and traditional Chinese calligraphy hanging on the wall. But what’s special about Millagarden Dihua Branch is its outdoor seating. Since this store is located near URS127, they share an open space, that is just perfect to sit down (with the strong scent of espresso, no less) and enjoy the art installment. ArtYard, URS127, URS44, and Millagarden Coffee can all be reached by taking MRT to Zhongshan station. Take exit 1, and then walk to the direction of Dihua Street section 1. MOCA is not located near those aforementioned places, but we assure you, it is different from any other museums in Taipei, and worth the trip there. Once an elementary school built in Japanese-ruling era, the historical building has since been refurbished. As it bears the name ‘contemporary’, MOCA’s aim is to deliver modern art, not some centuries old vases and scriptures. And because it is modern art, there really is no ‘typical collection’, meaning MOCA will surprise the visitor with its unique exhibitions, scheduled neatly on its website. Current exhibitions include The Innovationists: The Spectacular Journey of New Media Art. One of the cool pieces on display is Anadelta by Chris Honhim Cheung, an inverted triangle structure which is also a musical instrument. It transforms touch into a combination of light and sound. Take our word, you’ll be surprised by what MOCA has to offer.